Though the developer warns its unfinished and in places even unfair, Grand Adventure!, by Grent with writing by EmptyGoddess and art by Jhomar Soriano, is nevertheless a compellingly creepy action adventure with a retro style. As it begins, you wake with a pounding head and a sense of deja vu, memories of a smiling girl dancing in your head, and it quickly becomes apparent something is seriously wrong here. 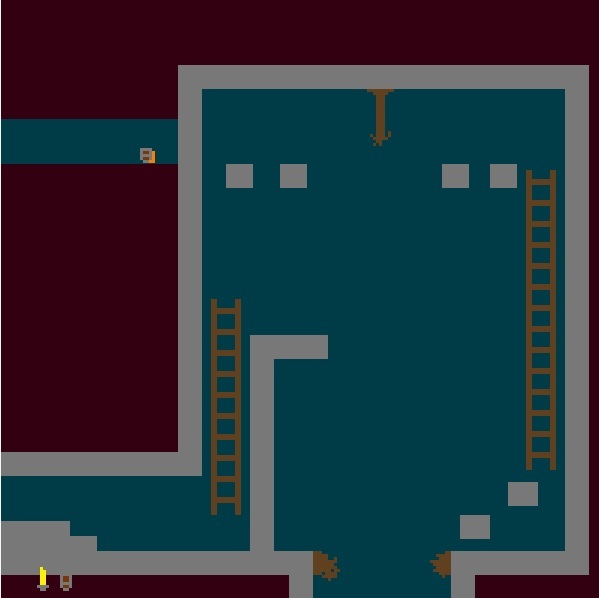 Use the [arrow] keys to move, and the [spacebar] to interact, with [Z] to swing your sword once you find it, but keep your wits about you... there are puzzles and traps everywhere, but if you die, you'll just be set back a short ways. Grand Adventure! has a great blend of classic pixel graphics that are intercut with more "realistic" artwork that serve to tell the story, building foreboding as you go, with a surprising amount of tension for such a simple presentation. You might not want to play this if you get easily grossed out or disturbed by gore, or if, oh, say, you have an aversion to bugs. Unfortunately, the game is missing what the developer intended to be its "true" ending, but what exists is still a great morbid fairytale style adventure that's well worth playing, and we hope we see even more and bigger adventures from its talented team down the line. Does anyone know which room has the secret path to the purple orb? How do I defeat the giant spider? I've tried cutting the spiderweb it's hanging from, to no avail. Waiting at the topmost platform just delays my getting killed, and I can't jump high enough to get to whatever room is presumably above this one. Thanks, I was trying to cut it from the topmost part as opposed to standing on the spider's back. Cannot move myself. Arrow keys does not work! three endings. The first you receive through the first playthrough of killing the last boss without finding and using the orbs. The second happens when you kill the final boss three times this way. The third happens when you find all three orbs and use them to defeat the boss and rescue the girl. Anyone found the fourth ending? How about that diamond shaped black spot in the game slot? Is this final ending the missing one that Dora referred to? uhhhh, nothing. I have never played zelda before. The classic games at least. I played a 3ds game in 2009 or 2010, and I have played some demos, and beat SSBB, but I have never played a pure Zelda game before. You'll find the passage to the orb in the graveyard where you kill the ghost. The entrance can be found by messing with one of the grave markers. The entrance is found by moving one of the grave markers in the row of graves second from the top and to the right of the graveyard. If an orb is placed during the final boss on the third playthrough without the others, when you load game you will spawn in the room for that orb. Attempting to exit will stick you in an endless loop of the cutscene for that location. got all the way to the ghost and gave up... going 'rrr' at how bad it and awkward. 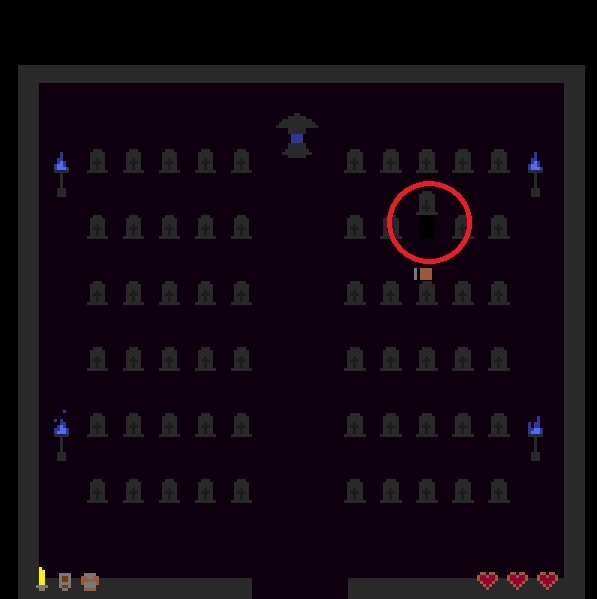 Hint for beating the ghost: If you position yourself in the center aisle around the first row from the bottom, the ghost tends to spawn and move at points where you can reflect the fire back at him, and you can easily dodge by moving up a bit when he sweeps across the bottom of the screen. Look for the grave with the upside down cross and push it up. Overall, solid game design with good visual clues for the orbs. it is found on the first screen where it turns into a side scrolling adventure. ?????? YOU Repeated ME. I said go straight. You said left is bad, right is worse, back is useless, you are walking on solid stone, which way should you go? I was explicit but kinda confusing, but if you know where to go it makes perfect sense. You spell it out in length. We Are Arguing The Same Side/ Same Point. I have no idea where that is (the place to find the green orb). I won't be able to sleep at night unless I find it. Nevermind. I found a walkthrough, haha. From the moment it says "There's something hanging from this tree", you know it's going to be creepy. I gave up at the ghost part. I don't always do well with horror games, but apparently I can cope with creepy pictures better than tiny monsters chasing me. Judging from what the writer (Emptygoddess) wrote on the Newgrounds hub page, yes shjack, that is the missing "true" ending for this game. Basically, the game is supposed to have a loading mini-game, and completing it was required to achieve this ending. However, quoted: "Programmer after programmer dropped out before it could all be quite placed how I wanted." Long story short? The best ending we can ever hope for seems to be the third ending. Considering that this game has been sitting for four years already, I highly doubt that the writer has any intentions to find another person to help complete this game, which, imo, is a huge shame. I mean, I've already spent the time to do 4 replays to get the third ending, I'm willing to spend a few more minutes to really be satisfied with a true ending. You don't have to shoot the fire at the ghost itself. Just bounce it at the torches. It's much easier that way. Stand just below and just above each bottom torch with your shield pointed up and you'll get all the torches lit fairly easily. In the room where you killed the spider, cross over at the top all the way to the left. Then jump against the left wall and slide down from the top, and you'll wind up in a hidden niche that leads you there. Any found out what to do in the library with the black book case? Once you place all 3 gems on their places in the final boss room, you get to control the princess. She can interact with the black bookcase. You can find the second gem in the room where you cut hanging rock. The second room after going north from the main room. Otherwise he is correct. Found a glitch, hard to figure out what is a glicht in a weird game like this, but my character is gone and I can't get it back. I dropped the weight into the thing that breaks to get to the spider room, on my second playthrough, but then I decided not to jump into the hole, because I was trying to do something different, to see if anything happens. I went back and I appeared outside the border of the room I expected to appear in. Then I thought, great, another secret passage, outside the room (and walking on the border as if it were the floor), how creative, but then I jumped down and fell out of the screen. I could still use my sword and hear the sound effect, but I disappeared. I'm pretty sure this is unintended. The first place you want to go once you’ve entered is west. Simply pull the first 4 levers and proceed until you reach the dragon bones. Once the running is over, hit the space button as fast as you can to flip the switch and kill the dragon. Go back for the sword and look south to find a slightly darker piece on the wall. Break it with your sword and grab the stone inside. Once you’re back in the middle of the castle, go north, towards the shield icon. Cut the stone that’s hanging from the ceiling and proceed downwards. Once the boss fight starts, try and be as fast as you can, as you won’t have a lot of time. You’ll have to cut the spider web three times, while jumping onto higher platforms in the meanwhile. When going back, climb up where the giant stone was and jump towards the wall on the left. You’ll end up in an invisible hole which will lead you to the second stone. Use your shield to reflect the fireball and break the statue that’s blocking the way. 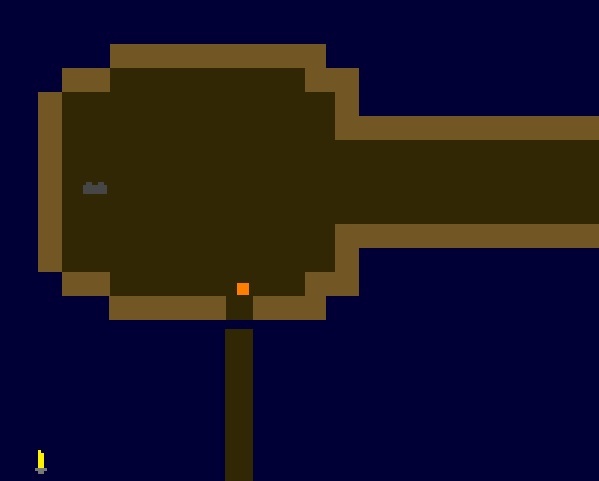 Once you’ve reached the castle, use the lit torch to light-up the other four and proceed inside. When the boss fight starts, find a comfortable position, where you can easily dodge the ghost (the middle of the room is a good option). Simply reflect the blue fireballs in the middle and the boss is most likely to walk into them. Once the big ghost is gone, look for the gravestone with an upside-down cross on it (second top row, right side). Inside you’ll find the third stone. The first ending is a restart of the game. Simply kill the final boss with your sword and you’re done. For the second ending you’ll need all three stones. There are three pillars next to the giant yellow door which leads to the last boss. Place each of the stones on a pillar with space. A hole in the ground will appear, leading to a huge library. Once you get to the boss fight, go to each side (left, top and right) and simply press [space] to place the stones. After all three stones are set, the boss will be defeated and you’ll take control of the girl from the visions. Go down the library and to the black bookcase which leads out.